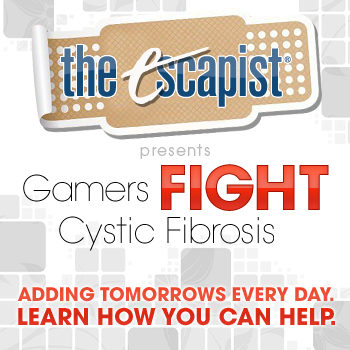 The Escapist will attend an auction to help raise funds for cystic fibrosis research this Monday, November 7th. As far as diseases go, cystic fibrosis is really crappy. The Escapist has supported research to help kids like 5-year-old Savannah deal with the disease and reduce the effect of the symptoms on her game-playing. On Monday, November 7th at 6pm, members of The Escapist staff will be at an auction held at our office neighbor's Joystick Labs. Local and international gaming companies like Epic Games and SEGA have donated products for the auction with all proceeds going towards cystic fibrosis research. If you live in the central North Carolina area, come on down to the Durham Underground Campus near the Durham Bulls ballpark on Monday night. You'll get a chance to meet the crew from The Escapist and help some kids. I am personally hoping that there will be a statue of Cole Train in his thrashball gear and maybe one of those cool Lego architecture sets. Come on down to Durham to find out what's for auction and help fight cystic fibrosis.